Right from the simple traditional pieces to the most stylish ones, blouse fashion has drastically evolved over the time. However, we all love to experiment with different styles and have also adapted it to suit our comfort. Just like other apparels, blouses too are available in a variety of patterns, colours and styles. To name a few, there are halter necks, high necks, backless blouses, etc. If you want to try out a new ready-to-wear blouse style, check out TheHLabel.com. TheHLabel.com is a one stop shop for all your fashion needs- western, ethnic and fusion wear. TheHLabel also gives you the advantage to customise the garment as per your fit. What’s more? You can buy designer garments at affordable prices. 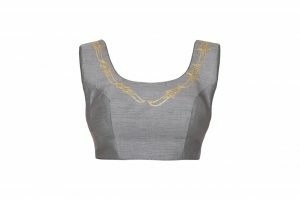 Look graceful in this grey embroidered sleeveless blouse by pairing it with a silk or crepe saree. The blouse is highlighted with block print which adds charm to it. Team it up with the tinted gold jewellery and jazz up your look. At TheHLabel, you have an array of designer blouses to shop. Each piece is unique and designed for different occasions. 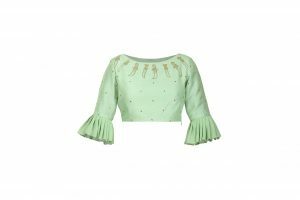 Check out this mint green blouse with delicate embroidery on the neckline. The pleated bell sleeves add the much required glam element to the piece. You can team this up with a printed crepe saree and complete the look with a statement neckpiece. 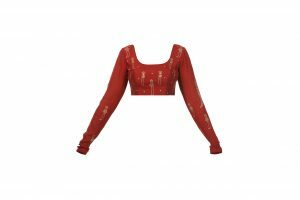 These days shopping for blouses is no more confined to regular shops and malls, you can even shop for designer blouses online. 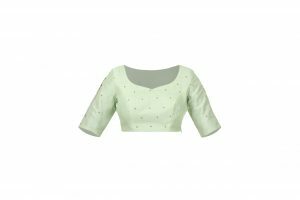 For those of you who love embroidery, this mint green blouse is a must-have. The blouse has scattered sequin work and hand embroidered on the sleeve. All you have to do is match it with your favourite saree. Bright colours are in! This ruby red block printed blouse is highlighted with fine embroidery all over. A party hopper can either team the blouse with a lehenga or a saree to a party. Traditional earrings such as jhumkas can go perfectly well with this look. You can pick these blouses from the Sultan-E-Shaan collection at TheHLabel.com. So, what are you waiting for? Start filling in your wardrobe today!